This is the long-awaited third edition of this highly regarded comparative overview of corporate law. This edition has been comprehensively revised and updated to reflect the profound changes in corporate law and governance practices that have taken place since the previous edition. These include numerous regulatory changes following the financial crisis of 2007-09 and the changing landscape of governance, especially in the US, with the ever more central role of institutional investors as (active) owners of corporations. The geographic scope of the coverage has been broadened to include an important emerging economy, Brazil. In addition, the book now incorporates analysis of the burgeoning use of corporate law to protect the interests of "external constituencies" without any contractual relationship to a company, in an attempt to tackle broader social and economic problems. The authors start from the premise that corporations (or companies) in all jurisdictions share the same key legal attributes: legal personality, limited liability, delegated management, transferable shares, and investor ownership. Businesses using the corporate form give rise to three basic types of agency problems: those between managers and shareholders as a class; controlling shareholders and minority shareholders; and shareholders as a class and other corporate constituencies, such as corporate creditors and employees. After identifying the common set of legal strategies used to address these agency problems and discussing their interaction with enforcement institutions, The Anatomy of Corporate Law illustrates how a number of core jurisdictions around the world deploy such strategies. In so doing, the book highlights the many commonalities across jurisdictions and reflects on the reasons why they may differ on specific issues. The analysis covers the basic governance structure of the corporation, including the powers of the board of directors and the shareholder meeting, both when management and when a dominant shareholder is in control. It then analyses the role of corporate law in shaping labor relationships, protection of external stakeholders, relationships with creditors, related-party transactions, fundamental corporate actions such as mergers and charter amendments, takeovers, and the regulation of capital markets. 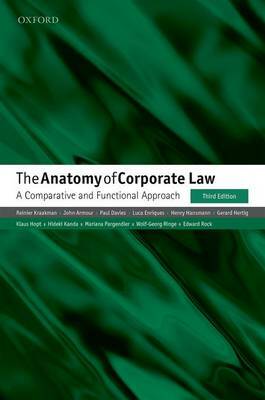 The Anatomy of Corporate Law has established itself as the leading book in the field of comparative corporate law. Across the world, students and scholars at various stages in their careers, from undergraduate law students to well-established authorities in the field, routinely consult this book as a starting point for their inquiries. "the cervical spine an atlas of normal anatomy and the morbid anatomy of ageing and injuries"